College football conference strength has a lot to do with television money, especially money that comes in from the conference’s own TV deals. 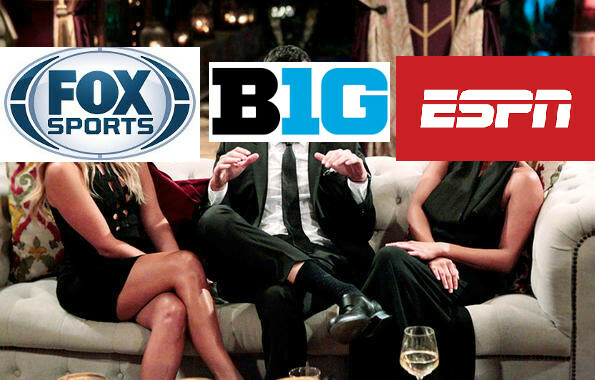 By that metric, the Big Ten may be set up for success, as their new television deals with both ESPN and Fox kick in this year and should vault them into the lead in terms of TV revenue per school. That TV money is having tangible effects, too, leading to the conference having five of the top fourteen paid coaches in 2016 as per USA Today (including Jim Harbaugh, tops at $9 million, and Urban Meyer, third at $6 million, before any bonuses). The splashy hires we’ve seen this offseason at even schools like Purdue (Jeff Brohm, six years, $20 million plus a $3.5 million annual pool for staff) and Minnesota (P.J. Fleck, five years, $18.5 million) also are proof of the conference’s riches. The cash spigot that is the Big Ten Network continues to pay huge dividends, especially since Rutgers and Maryland joined the league. In the fiscal year that ended in June 2015, according to USA Today, the Big Ten distributed $32.4 million to member schools that had full shares (Nebraska, Rutgers and Maryland did not). The money is about to go up, up, up. The league’s new TV deal kicks in later this year, a reported $2.6 billion package over six years. The Cedar Rapids-Gazette reported that per-school payouts are conservatively estimated to top $43 million in 2017-18 and could top out at $54 million per school at the end of the contract. The SEC is the only other league in that stratosphere, and the Big Ten is expected to outpace everyone in total revenue. “That’s the engine that drives every athletic department,” [Northwestern AD Jim] Phillips said of the rising tide of TV money. How far will the Big Ten be pulling away from the SEC in terms of TV money? Well, Bennett’s piece doesn’t say, but we know the Big Ten’s new deal averages $440 million per season ($220 million from Fox, $190 million from ESPN, $10 million from CBS for basketball). Of course, that’s annual value, and as this July piece from Forbes’ Chris Smith notes, these deals usually start at the bottom and grow over time. Assuming that the Big Ten’s new deals have a similar 5% annual escalator in place, that means the conference will earn somewhere in the neighborhood of $390 million next year. That same year the SEC will generate around $255 million in rights fees from its ESPN and CBS deals. The conference-specific networks are major factors here, but they’re mostly equivalent at this point – we figure each conference made around $125 million from its respective network. In other words, even at its least valuable the Big Ten’s new TV income will give it a major head start, and that should easily put the conference back in the hunt for the title of college sports’ most valuable conference. By that analysis, the SEC would be making about $380 million ($255 ESPN/CBS plus $125 SEC Network) to the Big Ten’s $390 million from regular TV revenue before factoring in postseason play. That’s not a huge gap, especially when you consider that each league has 14 schools, but the new Big Ten deal at the very least puts the conference on pretty equal financial footing with the SEC, and perhaps slightly better footing. Factoring in other conference-distributed revenue streams such as postseason play is how you get to those estimates of $43 million per school in 2017-18 (which would be $602 million total) and $54 million per school at the end of the contract in 2022-23 ($756 million total). The SEC could still come out ahead if it makes more from postseason play, and that’s certainly a possibility. Still, the Big Ten seems to be in pole position here. While debating who’s on top between the Big Ten and the SEC is interesting, what’s perhaps even more important is how both of those conferences are pulling away from the rest of the pack. Sports Illustrated‘s Andy Staples wrote a piece last May noting how the success of those conferences with their networks makes them the “Titanic Two,” and that’s certainly becoming more and more evident. That analysis had the SEC with $515 million total ($36.8 million per school) and the Big Ten with $431 million total ($30.8 per school) for 2015-16. Now that the Big Ten’s closer to the SEC, the gap to everyone else looks larger. The Big 12 made the next largest per school over that timeframe($302 million, $30.2 per school), while the Pac-12 had $351 million (29.8 per school) and the ACC had $328 million ($21.9 per school). ACC revenues are going to rise a bit with this new digital network, but not to the scale of the SEC or Big Ten networks, and while it’s possible the Pac-12’s network income could rise, it seems hard to imagine it closing the gap. If rights fees continue to rise, too, the Big Ten could be in a position to cash in again. Their new contract expires after 2022-23, ahead of the Pac-12 (2023-24), the Big 12 (2024-25), the SEC (2033-34) and the ACC (2035-36). Of course, no one knows exactly what the sports media landscape will look like leading up to the expiry of this deal, and being first may not actually wind up being most profitable (what if there’s a decline in the economy in general, or TV revenues in particular, right when this deal’s coming up, but a recovery ahead of other conferences’ negotiations? ), but it certainly would seem to be a reasonably favorable position. The Big Ten rights will be the first major college football rights available for bidding again, and if the conference continues to offer a strong on-field product, that might lead to a bidding war that could get them even a richer deal. Of course, conference money itself doesn’t necessarily indicate on-field results (after all, Clemson’s been to the last two title games and won this year’s, and the rest of the ACC also had a strong bowl season), and it doesn’t mean everything, but it has some merits as a measure of conference strength. That’s especially true because so many of the other ways to define conference strength are very focused on the short term. Overall bowl record in any particular season? That’s not great, especially as it has so much to do with matchups. College Football Playoff record? That might be a bit better, but it’s a small sample size, and it does also depend on matchups and whether or particular teams were chosen or not chosen by the committee (and it’s very top-heavy). TV finances have the advantage of applying to the whole conference and of being relatively consistent year to year, and they definitely appear to be putting the Big Ten in a position to succeed. The conference’s schools will still have to use that money correctly by hiring the right coaches and making the right facility upgrades, but the revenues they’re bringing in certainly give them plenty of opportunities. Pingback: Will Pac-12 Networks pres Mark Shuken be able to cut coverage deals?